Read about our Tuscan book launch! Picture a tiny village, the smallest place you’ve ever been, a place half way around the world. 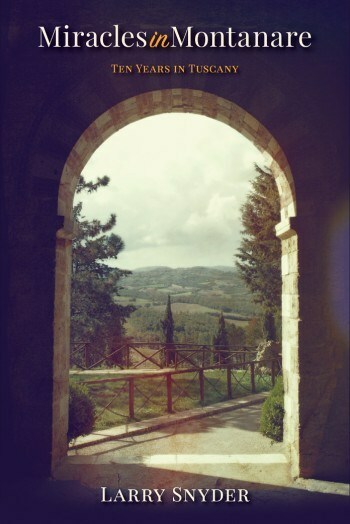 Tuscany! Inhabited by families whose roots run a dozen generations deep. You pull up stakes, quit your job, and move to that ancient place for a year. No one speaks your language and you don’t speak theirs. Now imagine that despite the language barrier, these people become your dearest friends, an extension of your own family that you return to year after year. A chance meeting over a shared connection to Italy brought Larry and Jill together. Within months, they suspended their careers, secured visas, and moved to the tiny hamlet of Montanare, Italy. A series of life changing miracles commenced. Embraced by villagers Primo, Francesca, Piero, Rosetta, Amedeo and a tapestry of others, Larry and Jill discovered a new language, experienced cherished customs, and became attached to the land that provided each evening’s dinner. Ultimately, this digitally driven American couple learned a new human experience that fostered love, whole friendship, family, and spiritual enrichment. This is the experience Larry Snyder chronicles in Miracles in Montanare: Ten Years in Tuscany.